Bentley is doing great! (Ivy and Abraham pup) He is such a calm, sweet boy. He loves to go to the dog park. He weighs about 60 lbs now. He is a beautiful dog! He was so easy to house train, and crate train, and he never barks. He's a beautiful, well-mannered dog. We have many friends and neighbors who wish their dogs had 1/2 as good a temperament. He's the most gentle with our youngest (age 2). He's 85 pounds (big!) We love him! My parents are now interested in getting a puppy from you guys! Do you have any information on the litter being born soon? I am going to give my mom your email address as well so she can communicate with you directly. I am so happy with Pippin that I can't see any reason for them to go elsewhere. He is a perfect companion and I know when I go home for a visit in a week that Kate (the little girl I had with me when we picked the puppy up) will be harassing me to let him stay. Their golden is getting older and my mom is getting very sad :( She would like to have a puppy there for Kate because she and Spirit (their golden) are inseparable but he is having a hard time keeping up with her. Happy and Healthy New Year to you and yours, Diana. All goes well here and Glory is just gorgeous and growing like a weed. She weighs about 32lbs now and the vet says she is just perfect. We have decided to spay her this Jan. 17 on recommendations from our veterinarian son and our own vet. As you can imagine she is incredibly energetic and so much fun. She is totally housebroken now and sleeps through the night ON OUR BED!! But we love it. She does stay in her crate, however when we have to go out and she cannot come. Otherwise, we take her everywhere and she loves the car. We just returned from a very long road trip to FL and she did great. What a wonderful little traveler. We head west to Idaho at the end of Jan., so we now are confident she will do well on long car rides, and of course we will head north to Canada in the beginning of May. We cannot wait to get her to the lake. She loves water and resorts to playing in her water dish. It is a riot to watch! We take her to the off leash dog park (Stoll Park which is directly across the street from us) twice a day for an hour in the AM and an hour in the PM. She gets plenty of great exercise up there and she needs it and loves it. In the beginning she was a bit passive, but now that she has grown she jumps right in there with all the other dogs. You are going to love this. Her best buddy up in the park is a dog named Wally. He is the offspring of Myra and Austin!! Small world! Anyway these two adore each other and play so well together. We just love that they have found each other. We still follow your website and just love seeing the new pups. And how wonderful that Austin has found a good and loving home. He is such a beautiful dog. I thought you might like to see a picture of Tucker at one year old. He was from Peaches and Rico's litter born on April 3, 2009. He was originally "Big Male" but then was "Red Collar Male" when we picked him up from you. He is a wonderful dog with a loving personality. He is playful and loves to be with the family, esp. my husband. He has gotten a lot of compliments and we have told many people here in Maryland that after several months of research that we decided to go to Kansas to get one of your goldens. It was the best decision, he has been a great addition to the family. very playful and ALL the kids in the neighborhood love her very much! giving us the opportunity to have her! Harley is absolutely wonderful and is the hit of the entire neighborhood! He is my constant companion and is with me all the time; I can hardly wait until he is big enough to attend my horse shows! I have a dressage event coming up next weekend at the Longview Horse Park, thinking with the cooler weather of taking him with me and having him man the booth with my assistant as he is definitely a ?chick magnetic?. You would not believe all the compliments I have gotten about his wonderful disposition and coloring, everyone always asks where I got him. Harley absolutely adores children and is incredible with them, never jumping up or biting them which is good as we are in a neighborhood that has many running around. I just cannot believe how fast he is growing; he is already on his third dog collar. I would love to come down sometime and show you how Harley is doing, he is just the cutest puppy I think I have ever seen, but then, most puppy owners probably feel the same way. His coloring is fantastic, I think he will probably stay fairly light, his feathers are coming in snow white. Will send you some pictures soon, I plan on taking more this weekend for my puppy book I am making putting together. Abigail is doing great, full of life and personality. She keeps us entertained, and Kelley (our 10 yr old Golden) young and playful. I?ll be in touch around the first of the year. attractive he is and his personality. Star is doing great. She is so sweet. We let her play with Candie, our white golden and one of our other Goldens, Misty. They are the 3 Amigo's. They all get along so good. It?s fun to watch them play together. She's a welcome addition to our golden family. Diana ? Toby is doing just great. I got her spayed two weeks ago and she did just fine. She has been totally potty trained since 3 ½ months. She has been through a Puppy Head Start class and was the friendliest and one of the busiest in attendance. She is absolutely beautiful ? still pretty light in color, strong, inquisitive, happy, loving ? I can?t tell you how many comments I get ? like you are going to Show her aren?t you or You are going to breed her aren?t you. She loves to go for walks. I am truly enjoying her so much. I?ll forward some pictures soon! Diana, I am sorry we have not communicated with you about the Golden Retriever that we got from you. We have named him KC (for Kansas City, Katie & Christopher, and for my dads previous golden named Casey). He has turned out to be a fantastic dog that is very calm, never jumps up, and is extremely well behaved (he hasn't chewed anything beyond his chew toys). He is great with the kids and allows them to climb all over him and never growls or is bothered. He is now about 78 lbs and in great health. I don't have any pictures I can send at this time but he is a beautiful healthy dog. Thanx again. We will be in the market for another golden retriever sometime within the next year or so as our 15 year old Pekinese mix is starting to show her age and when she goes we will start with another puppy as a playmate for KC (and we would not want to put the Pekinese mix through another puppy....KC is about all she can handle). beautifully. He is so smart and has the sweetest temperament. He and our cat Coco have become fast friends spending lots of time chasing each other and playing in our backyard. Our crate training was soooo easy......he only had a couple of accidents inside and now goes in and out of his doggy door as needed. We couldn't have asked for a better family dog. He likes taking rides in the car for play dates and swimming at the lake. Thanks again for our precious gift.............Oliver. We will keep in touch and forward more pics as he grows. Yesterday was our 6th week in puppy school! She did so well and she loves it! We were practicing greeting the dogs and teaching them to sit and not jump while doing so. Madison has no problem with that! One of the other owners said Madison is definitely going to be the Valedictorian of our class! We are so proud of her! We are very sad that we will miss our graduation, though, because we will be on vacation. She now weighs 28.8lbs! She is getting big and ever so beautiful! The vet said she is "absolutely perfect" last week at her final puppy shot appointment! Potty training is pretty much complete! Thank Goodness! She loves our daily walks, chewing on her bones, eating ice cubes, playing with her big brother, swimming, riding in the car, watching TV, and her stuffed toys! How are you? 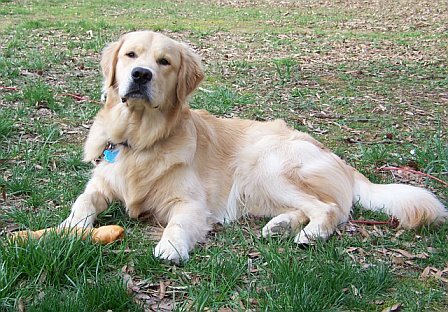 if funny how you said, "This is Diana Conard of Risa's Goldens". I could never forget you. You are how I got Ben, he is the greatest dog ever. He is the best dog anyone could ever have. I have had dogs in the past, he is actually my 3rd dog, but I have never had a dog as great as him. I feel like he came trained, I have never has any obedience problems. He truly has the best temperament in the world. Ben will be 1 year old in a couples of weeks, he is great, I have had no problems with him, he is not very tall, he is around 75lb, he goes hiking every weekend for over 5 hours at once. He gets 2 hours walks daily during the week. He goes swimming once a week. He eats Newman owns and get 1 Nuvet vitamin at day. He has plays days twice a week, his best friends are a female chocolate lab, Female Rotti and a Male Boxer that about his age, I'm proud (I think) to said it seem he is the Alpha of the pack. I have not taken recent pictures of him, I was waiting for his birthday.